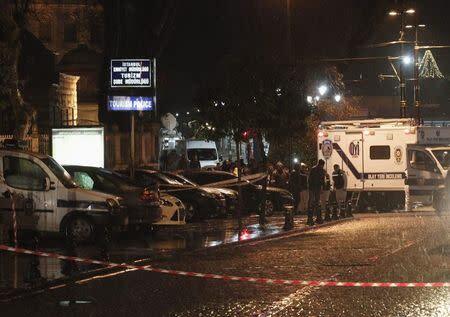 ISTANBUL (Reuters) - A far-left Turkish group has claimed responsibility for a suicide bombing at a police station in Istanbul's historic Sultanahmet district that killed one officer and wounded another, saying it was to "settle scores" with the government. A female suicide bomber on Tuesday entered the police station, saying in English she had lost her purse before tossing explosives at police and blowing herself up. The three-storey building lies across the square from the Aya Sofya Museum and Blue Mosque, the biggest draws for millions of tourists who visit Istanbul each year. A statement Revolutionary People's Liberation Party-Front (DHKP-C) website said the attack was against the ruling AK Party over the killing of 15-year-old Berkin Elvan, who died last March after nine months in a coma from a head wound sustained during anti-government protests. "It is the same state which shot Berkin Elvan and which protects the thief ministers," the statement said, an apparent reference to a corruption scandal that erupted in December 2013 around the inner circle of president and then-prime minister Tayyip Erdogan. "By doing something like this in Sultanahmet, one of Turkey's most important tourist destinations, did (the bomber) seek to prevent tourists from coming here?" Erdogan said during a speech at a university on Wednesday. "Do you think by doing this your ideologies will prevail?" The DHKP-C also claimed responsibility for a grenade attack on police at a historic palace near the prime minister's office in Istanbul last week and warned that more would follow. The attack could affect Turkish tourism, which generated $27 billion in the first nine months of 2014. Britain issued a warning urging visitors to Sultanahmet to follow the advice of authorities due to the high threat of "terrorism." The United States, European Union and Turkey list the DHKP-C as a terrorist organization. Kurdish separatists and Islamist radicals have also been behind bombings in Turkey. European governments see the main security risk in Turkey emanating from Syria, but a European diplomat in Ankara said they would be watching to see if this marks a new campaign. A series of arrests across Turkey and Europe over the last decade have significantly weakened the group, which traces its roots to Communist movements active in Turkey in the 1970s, but experts say it still poses a serious threat. It was behind a suicide bombing at the U.S. Embassy in 2013. In 2001, two policemen and an Australian tourist died in a DHKP-C attack in Istanbul's central Taksim Square. It has also carried out a series of deadly attacks on police stations.